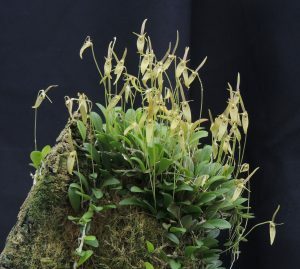 This species is a real miniature with 5mm leaves along a creeping rhizome and relatively large flowers single produced in profusion. Barbosella australis is native to Southern Brazil (australis means ‘southern’ and doesn’t refer to Australia – the southern land) and we have seen related species in Brazil at around 1200m in primary forest where a colony can clothe the lower branches of a tree. 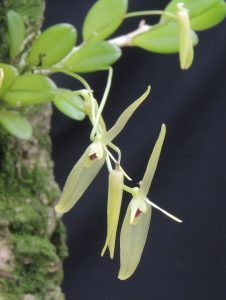 The species produces a profusion of flowers from both new and older leaves. We find that the only way we can grow this species well is mounted on bark where it can grow where it wants and eventually surround the cork mount as our plant has here. We spray our plants once a day.